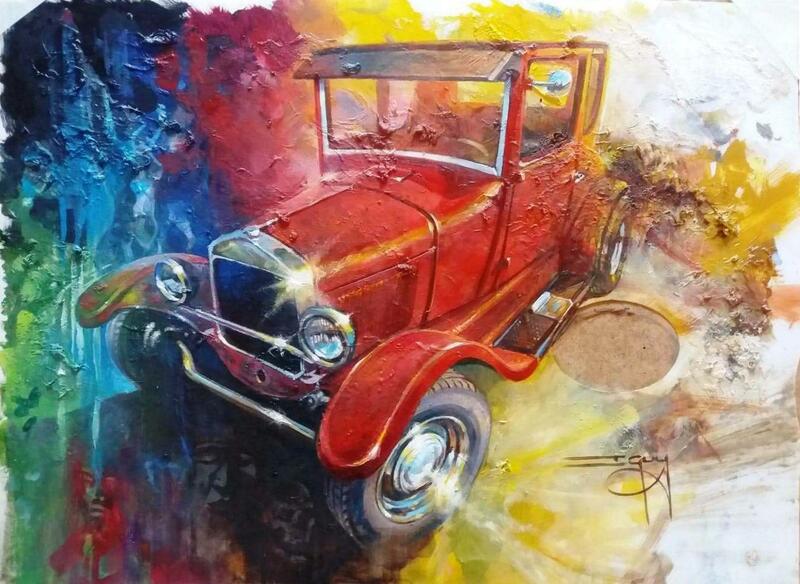 Ian Guy is among the foremost automotive artists in the UK with collectors of his art spread worldwide. Flicking through some photos recently I came across a rarity, for me, in the way of a set of progress shots on one of my paintings. 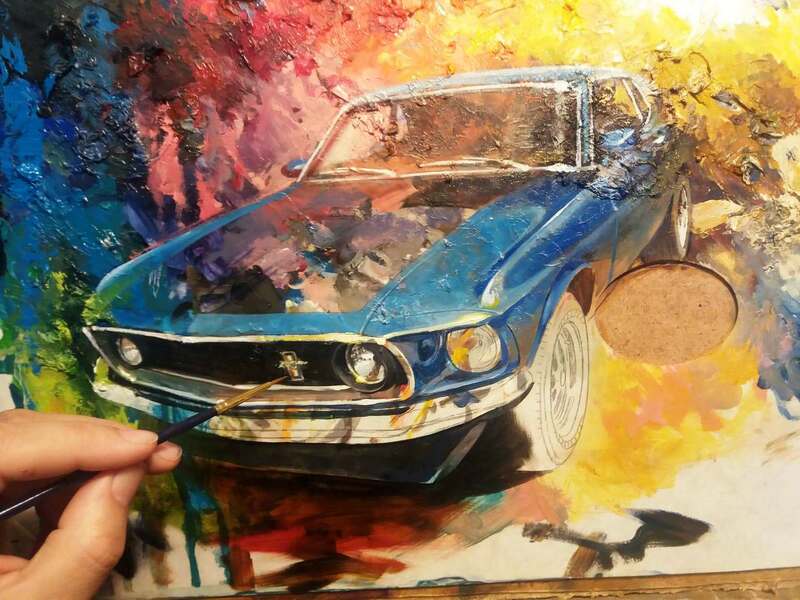 So here I can share with you the few photos I remembered to take on the progress of a recent commissioned painting featuring some real American Icons, a Mustang, an F150 Pickup and a couple of Harley Davidsons all resting at a classic Gas Station. The brief was to capture these two as the main feature and, although the setting was left to me, a Gas Station had been suggested. This was going to be a present for my client’s wife, she being the owner of both bike and car. Knowing him as well as I do I thought with only a little detective work I just might be able to get hold of a couple of shots of his bike and truck and slip them in to the background somewhere as a little surprise for him too. Good old Facebook didn’t let me down as a good source of photos. You’ll notice I’d progressed quite well into this painting before remembering to take a photo! But you’ll see a strong underpainting in sepia browns that I usually let dry overnight before working, as always, from the back to the foreground. In particular here you’ll see I’m already adding the surprise bike and truck, whilst leaning on my trusty self-made mahl stick with tiny brush in hand. Working on the building here and also defining the road on the left, including the white stripe that really helps to add depth to this composition as well as maybe lead your eye off to the distance to go exploring. Big jumps in the progress of this as, like I’ve mentioned, it’s so easy to get so deep “in the zone” you forget you’ve told yourself to stop now and then to take a snap-shot. Here I am getting lost in all the chrome and details of the Harley. Motorcycles can take so much time to complete, and get right! So there’s my tiny brush again working overtime. No, I wanted a character that left you asking questions. Although it’s not necessarily noticeable straight away, which is how I want it, the whole composition is based around the large image of a skull. At this stage I stop! … drink more coffee, stare and curse! Sorry this photo is so out of focus ! Too much coffee and burning the midnight oil. So it’s time for another coffee before taking a look at the canvas again as a whole. It’s finished! Almost an anti-climax as I stand there with a loaded brush and nowhere to offload the paint. It’s done. I didn’t decide it was done, it kinda decided for me. So there you have it, the ramblings of mind and coffee as another artwork is produced and another image is set free from my imaginings. The new look “MotoringArtist.com” is now up and running but still needs a bit of tweaking and we could do with some feedback. So to entice you to look over the new site we have a BUY ONE GET ONE FREE offer on all unframed prints, until the end of February ’16 ! Purchase your first choice of print through the website shop then message me with your choice of a second print for free. Please tell us what you think of the new website. All criticisms graciously taken on board. Author Ian GuyPosted on 17th February 2016 17th February 2016 Categories News, OffersLeave a comment on BOG OFF ! Here’s an example of how it all comes together. 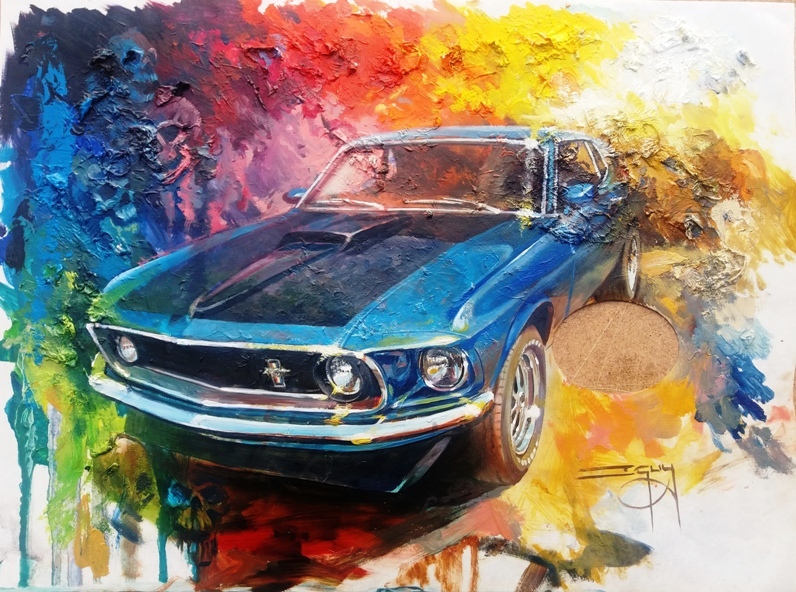 I’d met Les, Ros and their little boy Sonny-Ray at quite a few car shows, and we’d talked often about having their cars and Sonny-Ray painted. As always, I tell people I work from photos, usually their own, though occasionally I take the photos myself if the subject is close by. Les and Ros had the idea of capturing everything that was special to them in one big painting. So they sent me some photos of their cars, their home, two dogs, and of course Sonny-Ray. Les & Ros knew the size they wanted but left it to me to come up with a composition. I usually doodle a few sketches when there’s so many subjects to capture, but with this one I could see a layout that would work straight away. By placing the ’55 Oldsmobile Starfire center stage I had somewhere to put Sonny-Ray, and as it’s a convertible, there’s no roof to get in the way of their cottage. Using a rear three-quarter angle meant the windshield did not impose on Sonny-Ray and it also gave me the opportunity to show off that continental style rear end. I drew a slightly more detailed sketch to present to Les & Ros. They were pleased with the composition. I had quite a few photos of Sonny-Ray to work with but the one I kept coming back to was of him in his cart where he seemed to be transfixed by something ahead. I had the idea of him and their little pug dog both looking at the same thing, my first thought being a butterfly. I had ideas of other things to catch his attention but I often find the immediate thoughts are the best. So I was ready to commit my idea to canvas. I usually start by drawing the composition straight onto the canvas followed by a wash of colour with hints of light and dark to get rid of the expanse of white. Starting in the distance and working forward means the sky is the first area I work on. This sets the mood of the painting almost instantly. The cottage is by the sea and when you’ve a low horizon to play with what’s nicer than a sunset? Not too late in the evening though because of Sonny-Ray’s bedtime. Once the surrounding hedges are painted attention is given to the cottage. So here’s a close up of the area where the path arrives at the front door. Having met both dogs this one, “Missey Mae”, is such a gentle giant compared to “Big Boy” the little Pug. Now the lawn is complete the scene is set and work begins on the vehicles. I start at the back and give attention to the caravan (or travel trailer). Here’s a close up of the Chevy. When a painting is created from several different photographs I like to try and tie things together. Here I had the chance to reflect the front of the Starfire into the Chevy’s hub-cap. Sometimes it’s hard to know when to stop when it comes to reflections! Here’s a close up of highlights in the chrome and paintwork. Having completed the old Chevy and caravan I am now putting the finishing touches to the 1952 Oldsmobile. Work can now begin on the 1955 Oldsmobile Starfire. Such a beautiful blue and so reflective. The closer you look the more you might realise how little blue I use. There’s quite a pinkish hue to the top of the trunk lid. And down the side of the car the lawn is reflected. For me the juiciest bit has to be all that mirror like chrome on the continental kit. And now I start on the main center of interest within this whole painting, Sonny-Ray. Even though he only takes up a small area of this canvas, all eyes fall on him. And more specifically, it’s his little face we can’t help but zoom into. It’s this area that, per square inch, I spend most of my time. So now the painting starts to get quirky as I turn my attention to the little pug and to what all the fuss is about…. A butterfly that probably sits within a two-inch square on this two feet by three feet canvas. Having gone to bed thinking the painting was finished, I looked the next morning with fresh eyes and my attention was drawn to this area. Something just wasn’t quite right, and after a cup of coffee, it hit me that the rear wing of the car was looking too simple because I hadn’t seen that the little pug and the cart needed to be reflected into the car. I set to it and straight away everything ties together. Now the painting is finished. So how do I know when the painting is complete? When there’s nowhere left to put the next brush stroke. I might be stood there with a loaded brush and it just subtly let’s me know we’re done. So there we have it, a huge painting of a little boy who spots a butterfly, simple. We were glad to leave it to you to decide on the paintings content even suggesting that Sonny could be prominent or obscure (like Where’s Wally?) you were left to decide. 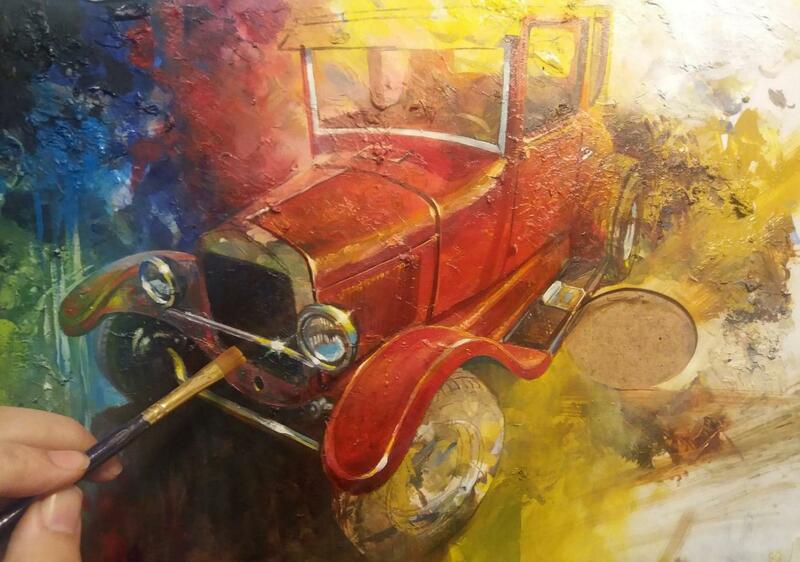 Your pencil sketch was well received but we never imagined just how fantastic the painting would turn out to be. As we said to you on the phone tonight we cannot believe the detail, the reflections, the sky, the realism, the proportions, the butterfly (we had 1000’s the same in summer) the…..
Les cried…. we cannot emphasise to you enough just how grateful we are. You are so talented Ian & if you are ever near Goldhanger come and see for yourself. It is perfect! We’re making a concerted effort to get to grips with the new look website. So far so good, with big thanks to Sam Weston of The-Weekend-Media.co.uk for all his help and patience. Author Ian GuyPosted on 18th January 2016 1st February 2016 Categories NewsLeave a comment on New Year, New Look! The Website is still under a little bit of development at the moment but everything should be functional .